What is it about a horse’s breath that smells so GOOD? 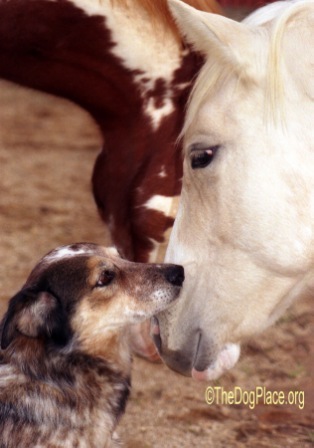 Even non-horse owners would agree if they ever touched noses with a pony. Is this genetic memory at work? A horse's muzzle is as soft as a baby’s bottom, well, if you discount the whiskers. Of course there’s the sweet smell of hay and green grass, and instinctively humans like that scent. But is there something more here, something long forgotten by us city dwellers but which our genes recognize? Does it have something to do with why we like to pull our shoes off and walk barefoot on the beach or across a grassy lawn? In fact, why, in this modern day and age, do we still value grass so much that we spend a fortune cultivating the last vestige of nature in a concrete world? We could get all scientific here about what makes a horse's breath so appealing but everyone knows horses prefer green grass and sweet alfalfa hay over steak. And then, well, let’s face it, they don’t lick their butts like dogs and cats. Still, it is has to be more than that. Take a breath of your heritage that will amaze and restore you. Think about it. First to come to mankind was the dog and then came the horse… There is nothing better to spur a child to independence than the thrill of sitting astride an animal so swift, so magnificent, so awesome! Asian, African, Australian. European, Norseman, Spaniard, or First American, you carry the "horse culture" genes that moved mankind into the world of skyscrapers, flight, science and medicine. As a dog owner or breeder, you have some knowledge of genetics or you wouldn't be at TheDogPlace.org. Horses speak softly to the senses. It’s not just their soft, sweet muzzles we’re attracted to. A well-kept horse is a delight to touch and safer to approach than the blue light special at K-Mart. If you've never run your hand over the neck of a show horse, you’ve missed a satiny sensory experience. Continue on to the shoulder and feel the steely muscle flex beneath your hand. Since we were little kids watching the big screen - Roy Rogers and Trigger prancing proudly down some wide-open trail, we have secretly relished the idea of getting away from it all on one of nature’s greatest gifts of speed and endurance. Imagine it. A fresh breeze wafting across uncluttered, unpolluted prairie grasses, clear blue sky overhead. 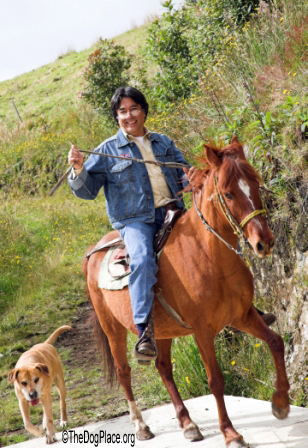 Maybe you’ll see no one today, it’s just you and your horse; him watching the trail ahead (he is a creature of flight after all and no matter how well schooled he is, he’s always alert) and you awed by the sight an eagle soaring on the wind. The jingle of the bit and soft blowing of a contented mount are sounds to soothe the soul. You dismount at a tiny stream and feeling very natural, you and your horse sample the clear water together. He tossing his head at the pleasure you afforded him; you cupping your hands to sip from man’s first cup. Feels good doesn’t it? Forget the cell phone at your belt. If you are really into this ride, it’s turned off while you spend some time with your history. The horse turns toward you, ears forward, inquiringly. You smile and like so many riders in the privacy of the moment, you stroke his neck. OK, you might even give him a kiss. Yeah, nose to nose. You breathe in the sweetness of his breath and imagine that you are a conquistador, a cowboy, an Olympic rider, or just a forty year old kid who found peace in the company of a four-footed friend. There's something about really being "above it all." If you don’t own a horse, you can rent one. Takes a little looking but there are many options from vacation ranches to riding stables. Public stables welcome novice riders and are willing to teach people who have never been nearer to a horse than a television set. Who knows? You may discover something about yourself, when you go nose to nose with man’s first mode of transport. There are no more Saturday afternoon westerns to delight and educate your kids. Why did you love those Westerns and Nature shows? And why my friend, have you forgotten that you did? 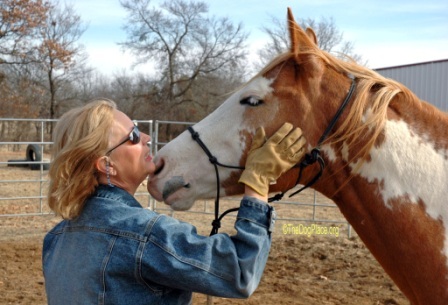 You are a curious intuitive person or you wouldn't have read this far so stay with me as we talk more about horse culture and what you may be missing in your psyche. If you have never experienced a horse's power, his calm acceptance of a human and the ease with which he elevates you into another sphere, I hope to inspire you. You may not go out and buy a horse but hopefully you will want to… And most of all, you will have broadened your intellect and widened your horizon. Oh, yes, that is what sitting astride a horse did for the first man who achieved that elevated position. Man looked at his world from a whole new perspective and he owned it. He became mobile with the means to be adventurous. He became a Conqueror. So think about this. If you have a handicapped child or one who feels uncertain, is shy, repressed or emotionally damaged - put that kid on a pony! Teenager out of touch with reality? Take him or her to a stable after you've called and set the stage. Then get out of the way and let magic happen. You know about therapy dogs. You glance down at the dog snoozing by your feet. Yep. That's what he is, now that you think about it. So if you don't feel inclined to rush out and jump on a horse, just imagine it. Feel the wind caress your cheeks, feel the power, his muscles flexing as you shift your weight. Squeeze him with your legs or touch him with your heels (depending on your saddle) and thrill to his powerful gallop. You are a Conquistador! A Pony Express rider. Or as in my blood, a First American and the horse will make you more powerful than the buffalo. And sadly, he'll transport you a dismal future. I promise, when you are "above it all" the world awaits you because you and he are one. Let the magic happen. If you can't quite manage that, I understand. But the next time you meet a horse, ask the rider if you can pet him. Go nose-to-nose, inhale the sweet scent, marvel at the softness and the flare of his nostrils. Then look into his eyes and see history come alive.